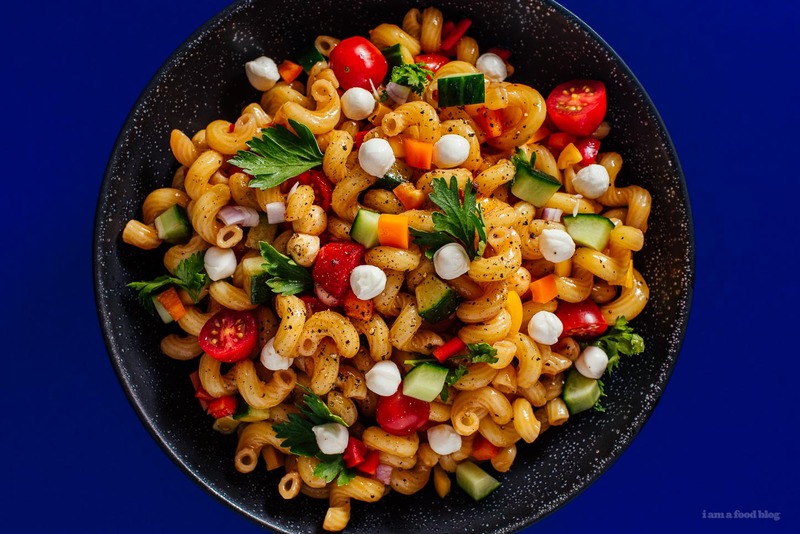 A sweet and summery pasta salad, full of crispy vegetables, tomatoes, and baby bocconcini. If you look at food on Instagram, I’m sure you’ve come across Dennis the Prescott. Maybe you didn’t know it was him, but his signature boards filled with burgers and fries, pizza, steak and potatoes, or lobster, have people double tapping like it’ll magically bring the food to life. I, for one, have drooled over the lobster rolls many a time. Dennis is from the Maritimes, here in Canada, and even though I’ve never met him in real life, I feel like if I met him, we’d have tonnes to talk about. 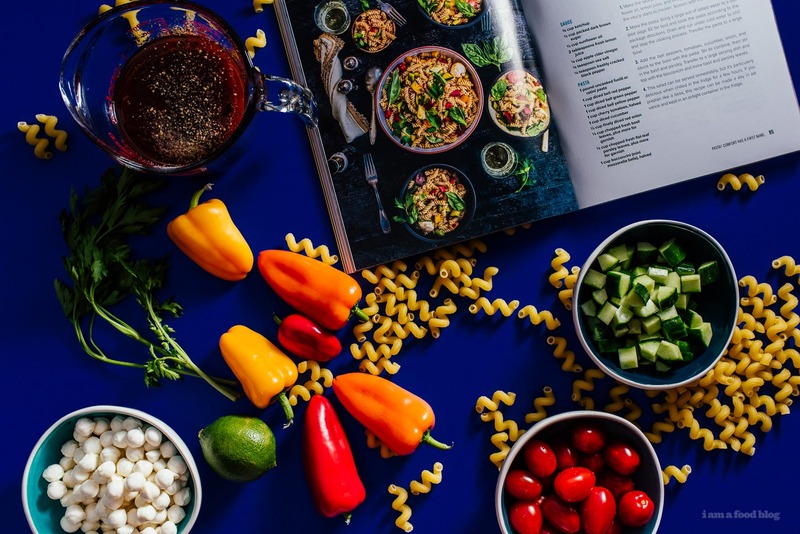 He recently released a cookbook, Eat Delicious, full of gorgeously photographed recipes, as well as tips and tricks on photographing and plating. I’m looking forward to trying his classic cheeseburgers and the gochujang maple surf and turf. Flipping through the pages, this summery pasta salad called out to me. Mike is a huge pasta salad fan and now I’m one too! So much so that we almost always have pasta salad when there’s a big family gathering. This guy is full of crunchy sweet bell peppers, cucumbers, tomatoes, and my favorite part, baby bocconcini. 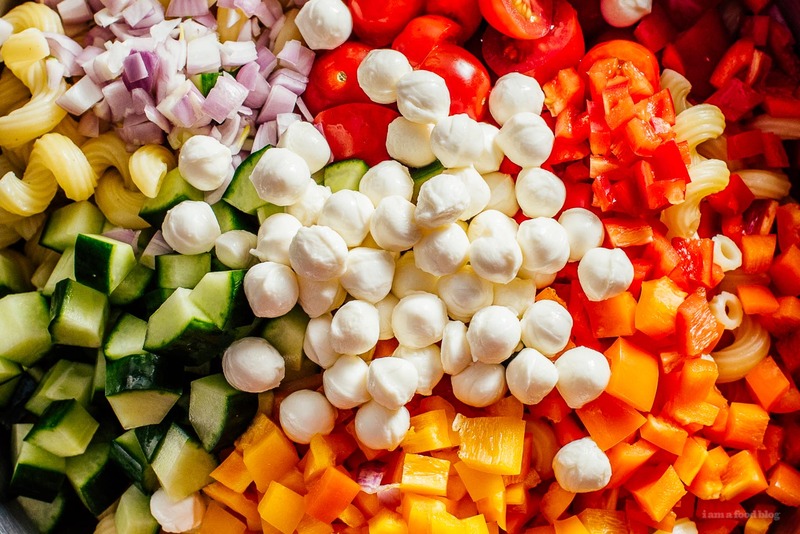 Sweet and summery, it’s a perfect pasta salad for your next summer get together. I halved the sugar because I don’t like my pasta salad too sweet, if you’re going for the full Dennis the Prescott feel, use 1/2 cup brown sugar. I also couldn’t find any nice fresh basil at the store so I skipped that, please add it in, chopped and as a garnish. Make the sauce: combine the sauce ingredients, whisking until slightly thickened. Adjust the seasoning with salt and pepper if needed. Cook the pasta according to the package in a large pot of salted water. When cook, drain and run under cold water to chill. Transfer pasta to a large bowl. Toss the vegetables and herbs with the pasta and sauce. Transfer to a large serving dish and garnish with extra basil and parsley. Enjoy immediately or chilled!